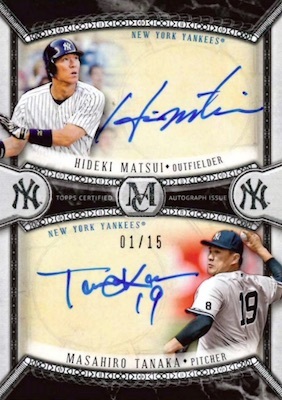 Fit for a private gallery, 2018 Topps Museum Collection Baseball oozes ornate designs while offering a selection of hard-signed content and quality swatches. 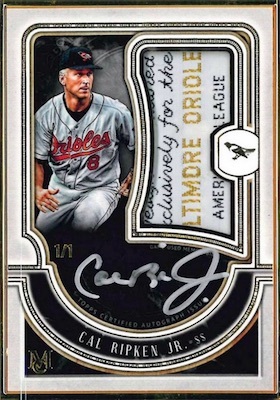 The hit-per-pack release promises one on-card autograph per box. 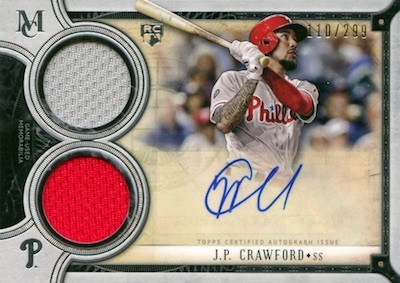 MLB fans can also find an autographed relic and two additional memorabilia cards in every hobby box. 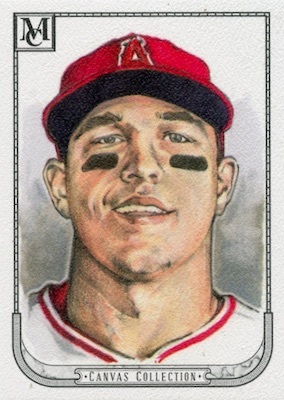 Sticking with the blueprint from the 2017 set, 2018 Topps Museum Collection features 100 base stars across several eras, including key rookies. Parallels consist of Copper, Sapphire (#/150), Amethyst (#/99), Ruby (#/50) and Emerald (1/1) options. A normal inclusion for the brand, the Canvas Collection insert is found in several different versions. Canvas Collection Reprint falls one per box, while Canvas Collection Originals and Canvas Collection Autographs are both one-of-one lines featuring hand-drawn artwork. 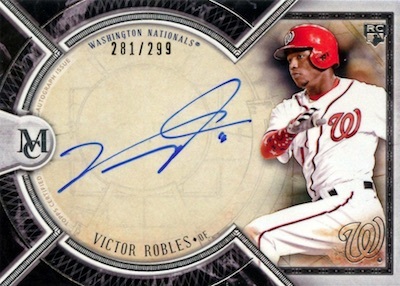 Dropping at least one per box, the 2018 Topps Museum Collection Baseball checklist is led by several hard-signed sets. Archival Autographs uses a horizontal layout for top players, adding Copper (#/50 or less), Gold (#/25 or less) and Emerald (1/1) editions. There is also the Premium Prints set, numbered to 25, which showcases gold ink signatures from MLB legends on black-and-white photography. 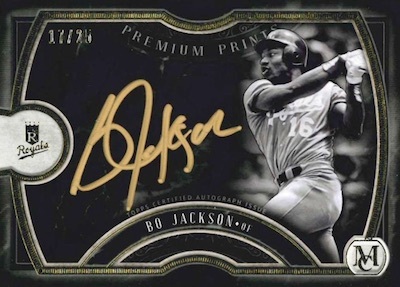 Long a focal point for the product, the case-hit Museum Framed Autograph cards utilize a metal frame to highlight the on-card signatures. Versions include Silver Frame (#/15), Gold Frame (#/10), Black Frame (#/5) and Wood Frame (1/1). Other chase options can be obtained with the hard-signed Dual Autographs (#/15) and Triple Autographs (#/5). Also coming in every box, the auto relics in 2018 Topps Museum Collection Baseball provide several more premium choices. Most likely to emerge are the numbered Single-Player Signature Swatches Dual Relic Autograph and Single-Player Signature Swatches Triple Relic Autograph cards. These are also found as Copper (#/50 or less), Gold (#/25 or #/5) and Emerald (1/1) parallels. 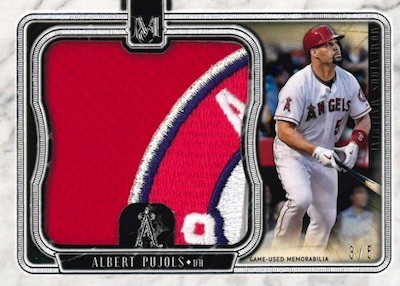 The place to look for more rarity, Momentous Material Jumbo Patch Autograph cards are numbered to 15 or less with a large patch. They have Gold (#/5) and Emerald (1/1) parallels, as well. A new addition for 2018 Museum Collection MLB, the Museum Framed Autograph Patch cards take the popular insert to the next level with the inclusion of game-used relics. 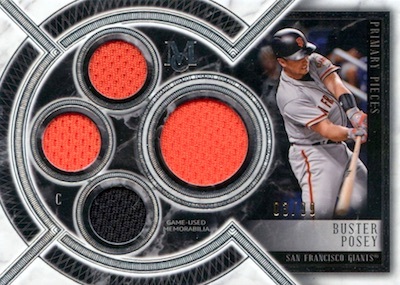 And providing the remaining hits in each box of 2018 Topps Museum Collection Baseball, relics are grouped as either "prime" or "quad." Among the prime lineup, we have Meaningful Material Relics and Dual Meaning Material Relics, each numbered to 50 or less. There are also Copper (#/35 or less), Red (#/10) and Emerald (1/1) parallels for both, while the single-player Meaningful Material adds Gold (#/25). 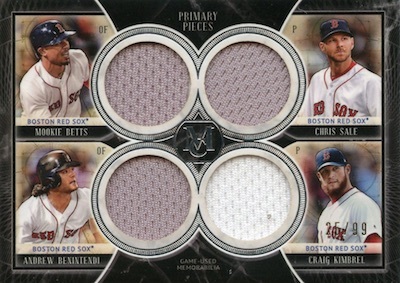 Capped to just five sets, oversized swatches abound in Momentous Material Jumbo Patch Relics. The Emerald parallel has just one copy. Other one-of-one sets include Jumbo Lumber Bat Nameplate Relics, Museum Memorabilia, with game-used MLB batter logos, and Museum Memorabilia Laundry Tags. Finally, displaying a quartet of memorabilia pieces and print runs of 99 or less, there are Single-Player Primary Pieces Quad Relics and Four-Player Primary Pieces Quad Relics. Parallels include Copper (#/75 or less), Gold (#/25) and Emerald (1/1). 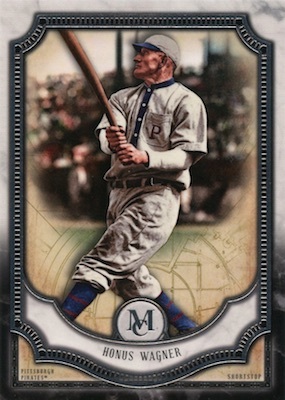 Less common, the Single-Player Primary Pieces Quad Relic Legends insert is home to all-time greats, and numbered to 25 or less. These legends have only Gold (#/10) and Emerald (1/1) parallels. PARALLEL CARDS: Copper, Sapphire #/150, Amethyst #/99, Ruby #/50, Emerald 1/1. 50 cards. 1 per box. PARALLEL CARDS: Copper #/50 or less, Gold #/25 or less, Emerald 1/1. 74 cards. 1 per case. VERSIONS: Silver #/15, Gold #/10, Black #/5, Wood 1/1. 27 cards. Serial numbered #/25. 84 cards. Serial numbered #/15 or less. 32 cards. Serial numbered 1/1. PARALLEL CARDS: Copper #/50 or less, Gold #/25, Emerald 1/1. PARALLEL CARDS: Copper #/25 or less, Gold #/5, Emerald 1/1. 91 cards. Serial numbered 1/1. 145 cards. Serial numbered #/50 or less. PARALLEL CARDS: Copper #/35, Gold #/25, Red #/10, Emerald 1/1. 25 cards. Serial numbered #/50 or less. PARALLEL CARDS: Copper #/35, Red #/10, Emerald 1/1. 52 cards. Serial numbered #/5. 187 cards. Serial numbered 1/1. 199 cards. Serial numbered 1/1. 77 cards. Serial numbered #/99 or less. PARALLEL CARDS: Copper #/75 or less, Gold #/25, Emerald 1/1. 20 cards. Serial numbered #/25 or less. PARALLEL CARDS: Gold #/10, Emerald 1/1. 20 cards. Serial numbered #/99 or less. 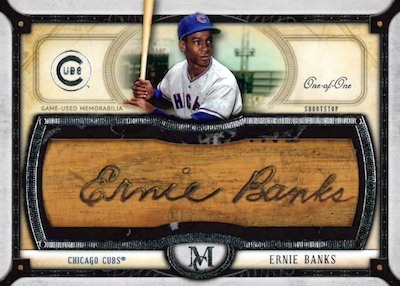 View the 2018 Topps Museum Collection Baseball checklist spreadsheet. I like how the cards look and how each team has people. I don’t like how they are still making cards of people that are on a different team than what they are now. 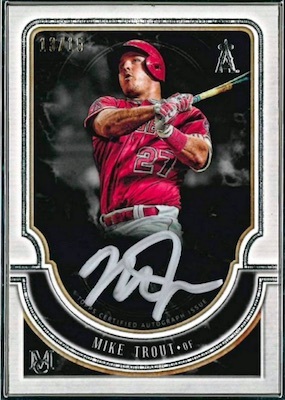 There is nothing more infuriating than seeing a player have an autograph in an upcoming product while you’re waiting on a redemption from the same player. I am waiting on a Ken Griffey Jr. 2017 Topps Finest Finishes Auto. Although that is an on card auto, and this is probably a sticker, there’s no excuse. I’ll take a sticker auto by now! Absolutely absurd. Topps we need some Eric Davis cards he had other great years with Baltimore give us some relic or jersey pieces !! I always love how this set tends to look but I hate the price point for what you get. 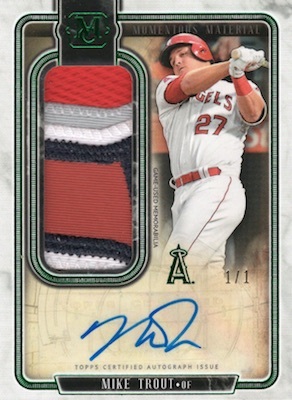 There are too many plain single color swatches in this product and too many sticker auto on the auto relics. 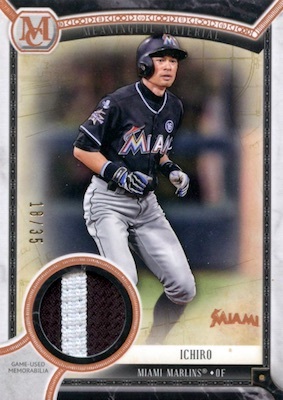 The patches can be nice but often times they are very boring two color pieces that could come from any part of the uniform. 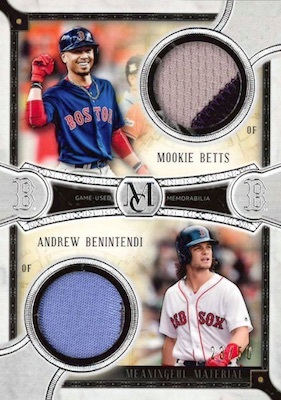 This seems to be a set that each year it looks like it would have been better used as an insert set in another set like Topps base or a set set up similarly to Panini Chronicles with inserts from various brands and sets. 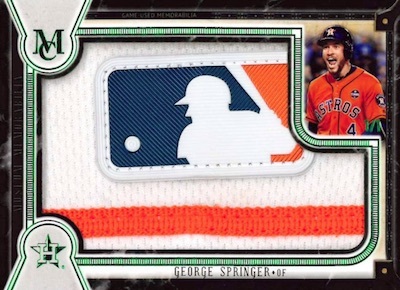 I bought several boxes last year of MTV and ended with a redemption altuve /25. This year I pulled a gold harper auto /10 so I’m satisfied. The auto patch gregorias topped it anyone else with good pulls? Nice looking product. Very disappointed in the cards I pulled from the box. A $200 box yielded cards worth approximately $60 (using Beckett pricing). Extremely poor value.